The first thing I did after finishing this lovely book was to order it for my grandson, so you know I liked it! This interesting historical fiction children’s book retells a traditional Korean tale, set in 16th century Korea. 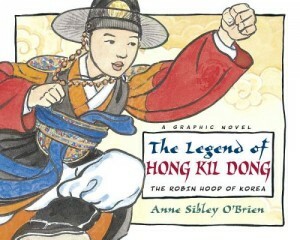 Hong Kil Dong was the hero of the first novel ever written in Korean. In this simplified version of the historical fiction story, we follow the trajectory of a young boy, who grows up to become the Robin Hood of Korea. I had never expected to review graphic novels, because I always assume the genre has sparse text and poor quality illustrations. When I first picked this children’s book up, I thought it was an illustrated book for younger children. Look ing inside, I found beautiful Asian artwork, set up in a graphic novel format, but laid out as a horizontal book. I immediately loved the way it felt, since it is almost a bridge from illustrated books to ‘real’ children’s books. In any case, the story is well written, the tale is heroic, and would appeal to anyone. It is particularly attractive for boys, as Hong Kil Dong makes a very appealing and magical hero. It would certainly be attractive to Korean boys as it presents a cultural legend. The Legend of Hong Kil Dong can easily be read aloud for 7 to 9 year olds, and older children can read this on their own. I would avoid the movie if you are planning to offer children the book.